Playing online slots can be quite a solitary affair; it’s something you do in the evening, or on the train or perhaps waiting at the bus stop. Wherever you are though it’s generally an interaction between you and the computer screen. That being the case there’s not really the same need to be aware of the kind of etiquette required at a bricks and mortar casino. 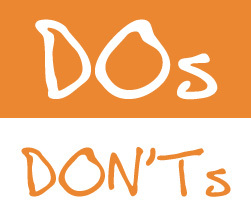 The do’s and dont’s we’re talking about here relate to your slots gameplay. Do pick your online casino carefully – think about what sort of bonuses they offer, their reputation, customer service – before signing up. Check our casino reviews and bonus guides for more information. Do check out the casinos which offer free play – this is a great way to find out which games suit you without having to pay a penny. Do make sure that you claim your bonuses when you sign up and deposit; some casinos require you to contact them to grab the cash while others may put a time limit on claiming and spending that bonus. Also make sure you understand that wagering requirements mean you have to bet your bonus amount a certain number of times before it can be withdrawn. Do make sure you are playing the correct number of paylines to give yourself the best chance of triggering the feature. Do remember to pay the little bit extra to play the progressive slots if you want to win those giant jackpots. Do try and give yourself a daily or weekly budget to spend on the slots – you can’t win every time. Don’t just sign up for the first casino which flutters it’s eyelashes at you; as we mentioned above, take your time and work out the best deal for you. Remember that the most generous-looking offer may not pan out like that when you delve into the terms and conditions. Don’t keep playing a game in the expectation of winning eventually; just because a slot has not paid out for a long time doesn’t make it more likely that it will in the near future. Read about the theoretical return to players here. Don’t use the ‘gamble’ feature too often – lots of games offer this facility and usually it’s a speedy way to part you from your winnings. Don’t spend more than you can afford to lose and don’t forget that playing online slots is not an investment opportunity, it’s an enjoyable pastime which can occasionally be profitable.